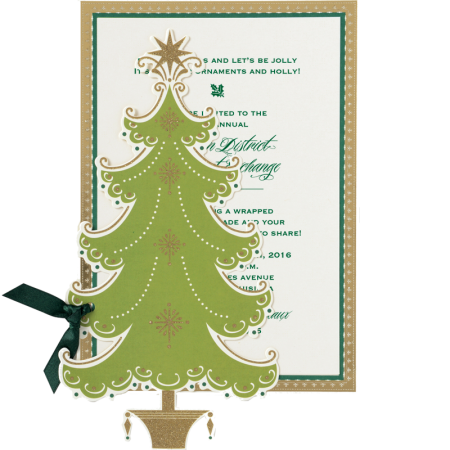 Description: Cheerful greetings and festive invitations in classic and contemporary styles from Anna Griffin. Trend setting Christmas trimmings are just the thing to help you deck the halls for the holidays! Each 5.25" x 7.75" invitation features a glittered diecut, printed card and ivory envelope. Assembly required. Return address printing, guest address printing, and double envelopes are also available. You have the choice of contacting us directly to place your order, or you can build up an Order List before contact. To build your Order List, please enter your quantity, personalization, ink color (if applicable) and any other specifics noted under "Pricing" for each item. Upon checkout, a Clark Stationery consultant will contact you to finalize your order, confirm details, select shipping, etc. All images are Copyright © by the applicable companies, and are used with permission. No part of this site may be used without written permission of For All Occasions/clarkstationery.com, and no image may be used in any way without the written permission of the company for which the image applies.